Royal splendour & solemnity; a private evening visit. 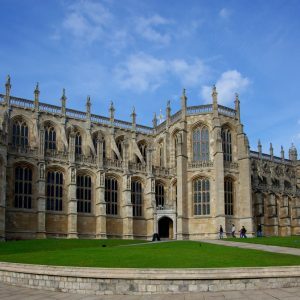 The cathedral-size St George’s chapel lies within the lower ward of Windsor Castle, HM the Queen’s principle residence. By special permission of the Dean and Chapter, we are privileged to have an evening visit to the Chapel of the Order of the Garter. Our visit will take place when the castle has been closed for the evening. Dating from 1475 under the reign of Edward IV, the present chapel is a glorious example of late gothic building. Within the Chapel are the tombs of 10 monarchs, including Henry VIII and his third wife Jane Seymour, and Charles I. It is the spiritual home of the Order of the Garter, the senior order of British Chivalry established in 1348 by Edward III. St George’s Windsor is among the most important and ambitious medieval chantry foundations to have survived in England. The college, itself a medieval chantry, also contains a number of independent chantries in the form of altars and small chapels dedicated to various members of the English monarchy and also to a number of prominent courtiers, deans and canons. Masses, the Office and prayers would be offered in these chantries for the good of the founder. Henry VIII had intended a chantry to be set up in the chapel, despite the fact that he instituted the religious changes which brought about the Reformation in England and the eventual suppression of chantries. The status of the college as a royal foundation saved it from dissolution at the Reformation. As a result, many of the smaller chantries within the chapel were preserved. These are the only remaining chantries of their kind in England which have never formally been suppressed. Led by our guides, the College archivist and the senior Chapter clerk, our tour will concentrate upon craftsmanship in stone, wood and ironwork of the late C14 and early C15. We will include access to the upper chapels such as the chapel of Queen Katherine Aragon. For this purpose, all those wishing to take part must be able to manage steep newel stairs. Cost £20. Booking essential. Group limited to 40 persons. Royal Household security applies; passport or similar photo identification required. Full details available from the Visits Secretary. Gather outside Henry VIII gate at 4.15 PM before evensong at 4.30 PM to be followed by the tour.